Affordable Accoutrements: Christmas? In July??? Make sure to stop by for a visit with Felecia at Playing Dishes. She's hosting "Christmas in July" every Saturday this month. While you're there, you can see who else is participating this week. There are sure to be lots of fun, imaginative "holidayscapes!" I decided to set a table for two (I won’t be pretentious and write it in French this time!) in the breakfast nook. I brought in wicker chairs from the solarium to remind myself that it’s a summer Christmascape. The Quaker lace tablecloth is from an estate sale. It’s a soft creamy yellow, old and worn, and launders beautifully. I layered some metallic netting and white fabric printed with metallic stars under the centerpiece (and then proceeded to cover it with … well, a lot of things). The china pattern is "Concorde" by Theodore Haviland. I layered lots of pieces and added a pear for the "appetizer." The dishes, the flatware, and the napkins are from estate sales. The Gorham napkin rings (with thrift store gold/cream earring embellishments) and the Cambridge Caprice candleholders are from antique shops. 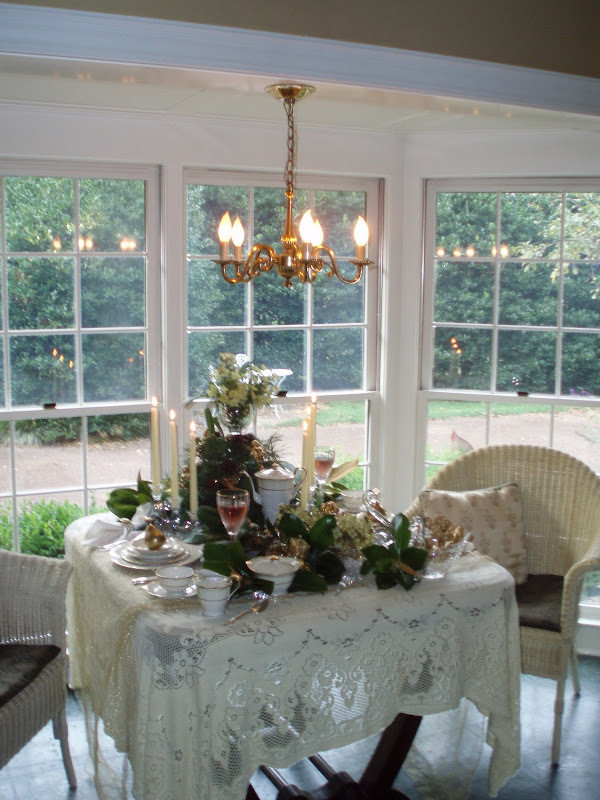 The centerpiece is built on a Fostoria Holly round platter topped with glass cake pedestals. On the smaller pedestal I placed a goblet from Goodwill filled with oak leaf hydrangeas from the garden. The gold colored ornaments were bought on clearance at Hobby Lobby. The larger of the glass swans is vintage -- probably by Duncan & Miller. The smaller one is from a recent estate sale. It's lead crystal made in Eastern Europe. I paid $8.00. Not sure it was a bargain, but I liked it. I scattered a few glass icycle ornaments in the foreground. The wine glasses are Mikasa. I bought them at a gift shop when they were moving and selling discontinued items at bargain prices. The silverplated flatware is "Jamestown" introduced in 1916 by International Silver. It's one of my favorite sets -- a service for 12 with serving pieces (including a carving set) -- bought on day 2 of an estate sale for only $35. One thing I like about it is that the knife blades are silver rather than stainless. I find the overall shape of the pieces pleasing as well. I'd taken several pictures before I realized I'd left off the coffee cups! Sorta needed those since the coffee pot, sugar, and creamer were in plain sight!!! I really like the Caprice candleholders. I have matching stemware I'll show you sometime. I went ahead and poured the wine -- thought I'd need it if I planned to relax enough to take a deep breath ... and get this finished by Saturday! So there you have it --- my version of Christmas in July. Hope you enjoyed the pictures. I'm looking forward to seeing which dishes you show us this week. If you have questions or comments, I'll be checking in from time to time over the weekend. Have fun and keep cool!!! Wow, when you stopped by earlier and said that you weren't sure if you would make it, I was disappointed. Now, I am amazed! This is what you pulled together? It belongs in a magazine. Everything is perfect including the chairs and the reminder that it is Christmas in JULY! The silverware is my favorite. It is so unique and pretty. Scratch that, I think I love the china more. It is so delicate and versatile and, well, just pretty. Then again, I am loving the wine glasses (could I have a glass?) and the candleholders. About that wonderful tablecloth...I would take it off your hands. Bill, I am so delighted that you found the time to pull this fabulous table together. 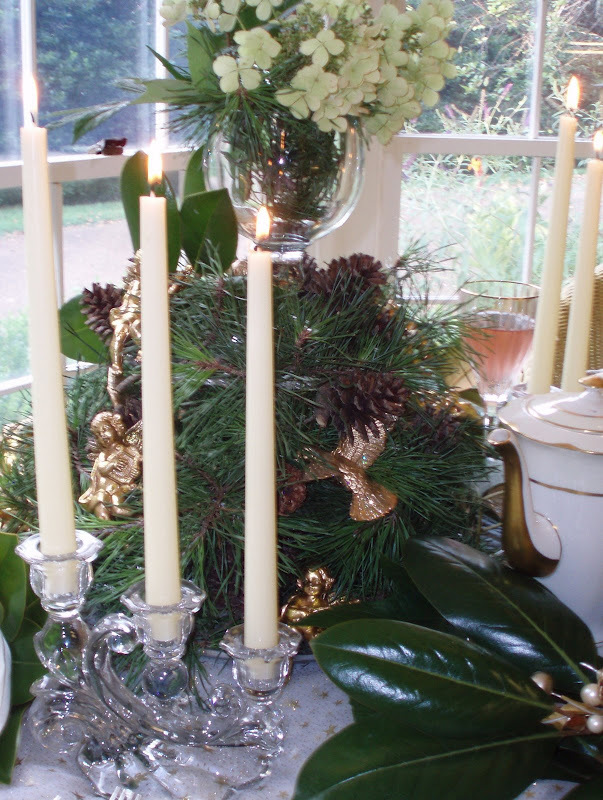 This is what Christmas table dreams are made of in blogland and real life. Hey, I also like the stuff that you added to the centerpiece. You are one talented guy. This is such a beautiful tablescape. Everything is so lovely and elegant. The dishes are so pretty and the swan... sigh... I just love that swan ♥ You did a wonderful job. Thanks for sharing. WOW! 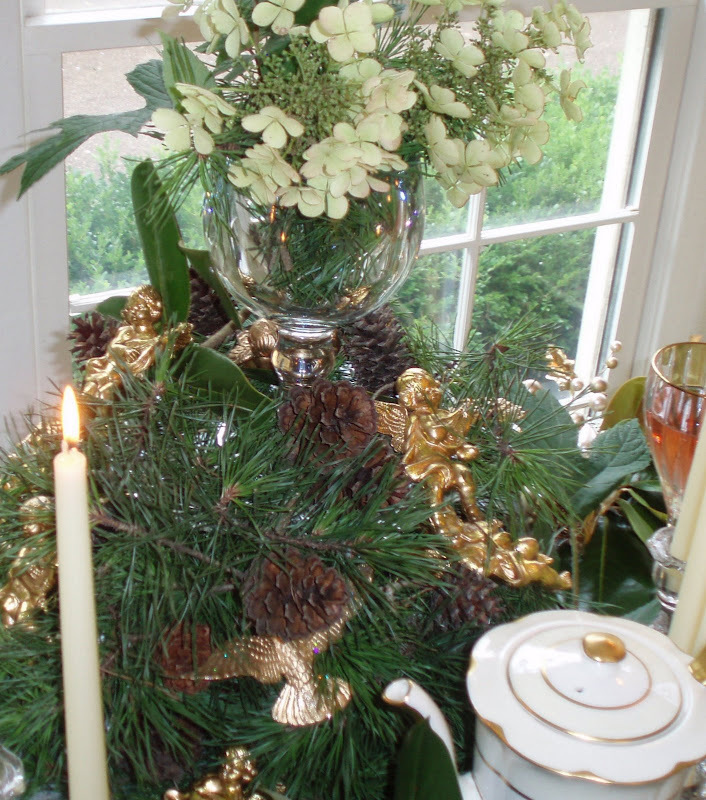 Amazing what you can come up with using some gold ornaments and gathering greenery! Your "Christmascape" is lovely. The candlestick holders and the swan are beautiful. I am getting inspired to come up with something myself! Maybe next week! Without doubt, It's Christmas in July. Elegant and perfect table. This is just perfect. I love to have so many interesting things to view on your table. You have wonderful pieces of china and silver. Thank you so much for sharing. A beautiful table -- you have such lovely things. Great Scott!! This is just stunning. I am so in love with your fine dishes. They are just beautiful and so classic. With our Texas heat reaching into the 100's, there is no way in hell I'd go up in my hot attic for Christmas decor...oh, wait...I do have photos of last Christmas...wonder if that would work?? Thanks so much for sharing your lovely tablescape with us...i really enjoyed it all. Absolutely beautiful! I'm at the beach so I'm far from Christmas decorations and won't be able to participate in this post party, but wow! I love what you did. The dishes are exquisite and the shape of the flatware is really unusual. I wish I could go estate sale -ing with you! WOW! You could have used my primitive bell balls for your makeshift tree. They have beautiful golden ribbons to hang from. Your setting is not only rich and beautiful, but perfect enough for anyone to sit & dine with. Wow, so spontaneous! I'm impressed! You are very talented at this! Thanks for sharing, Have a tea-rific day! Oh, I enjoyed seeing all this so much! I like all of your tablescapes, but you outdid yourself here! I just love it all! Absolutely magnificent!! Wow, this is fabulous! It's so elegant and you definitely pulled off the Christmas in July theme. I love it all, and the candleholder is gorgeous! I can nearly hear the Jingle Bells. If this is what you do for July, sign me up for Christmas!!!! 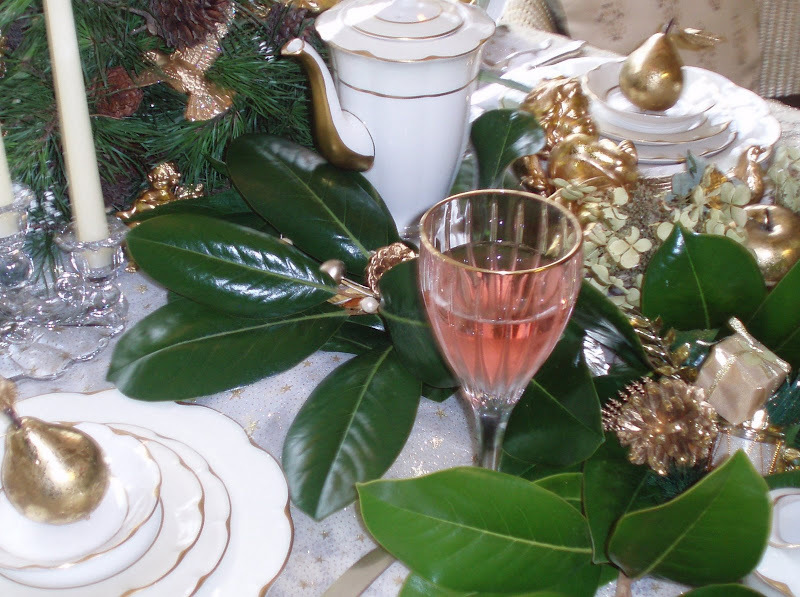 This July, Christmas table is so wonderful I can't wait to see what you do when December rolls around! I have the same gold cherubs and fruit. I believe great minds decorate alike! Hope you are having a good weekend. I L-O-V-E those gold pears! So unique! I've just started following your blog and look forward to more of these great posts. You are very talented! Bill, your results are always amazing. I wanted to participate, but a mouse up in the attic got into my Xmas boxes and I didn't want to greet that right now in this sweltering heat with a steel boot on! Probably fall off those tiny steps and break my neck then! Oh, your tables look straight out of a magazine! Where on earth have you been hiding? You show us women (like me anyway) how it's done. Here in Texas it's like how the cow ate the cabbage. Oh no, I think that's probably a non sequitur... Anyway, it's always exciting to click on your blog and see what you've come up with! I love the white and gold..So serene and elegant..
Wow Bill.. you pulled off that beautiful table just like that ... with a lil ole bag of gold ornaments.. I can only imagine what is in store for us 5 months from now.. It is magnificent.. love the gold, white & magnolia green color combo.. it's so royal & elegant! I left you a message on your Dixie Carter post.. not sure if you saw it or not.. I got to thinking not everyone has their comments set up like me and may not see comments on posts that are more than a week old. Hopefully you'll find it. Bill, that is nothing short of a huge "wow!" Anyone, me especially would love to sit at that table and just gaze at all that beauty! Glad you stopped by mine today and sorry for the late visit, too busy packing for a trip tomorrow. Again, "wow" of a table! I'm definitely coming back? Do you participate in Tablescape Thursday? If not, you should! I love those dishes! 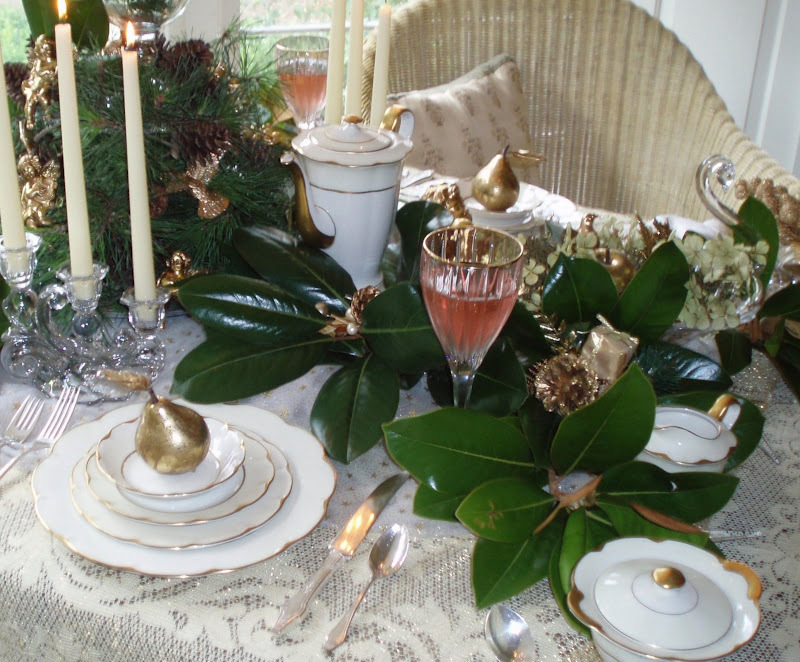 Hello Bill, your tablescape is magical, happy Christmas in July, Kathy. Bravo, Bill, this is exquisite! I love your Haviland. It sets the perfect Christmas table. My mother and I both have gold and white china. Love this! You set a magnificent table once again! Your attention to detail (love the swans and the magnolia leaves) is perfect. Bill, we're just going to have to call you the Kind of Tablescapes! This looks amazing! I can't wait to see your holiday decorations come December. Oops, I meant King of Tablescapes. That's a beautiful and timeless tablescape! Nice job! Oh dear -- I can see that there are some estate sales in my future -- this is just lovely - I too, am trying to figure out what I have here in house and not in the hot attic or the back of our shed. Nothing as lovely as yours - sigh- -- this is wonderful. Oh, Dear Bill! 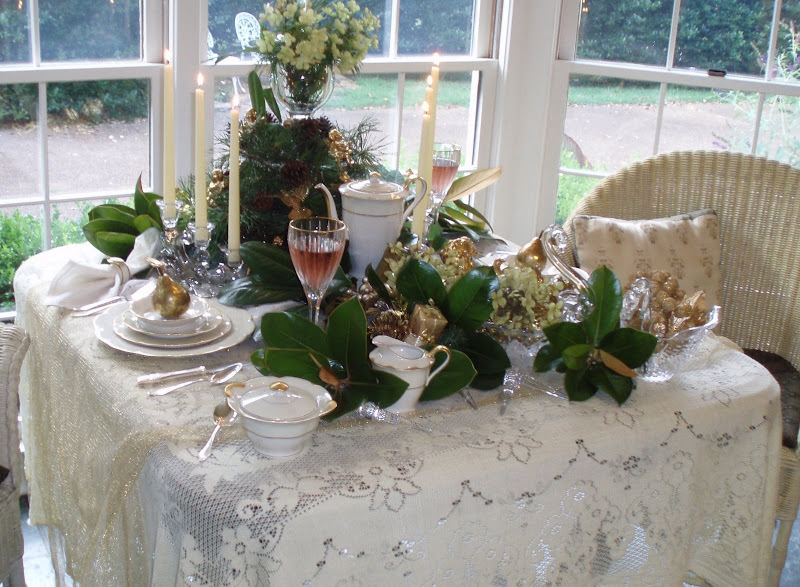 How gorgeous is your Christmas in July table! This is just spectacular! Oh what lovely things you've picked up at sales! The Haviland dishes are gorgeous! Love the scalloped edges with gold trim! Your centerpiece is amazing! I love all the foliage and those magnolia leaves! What a beautiful spot you table is in! Oh, do another tablescape...please...you're great at this! Just stopping back by to take another good look at all your eye candy here. Such a lovely setting..even that wine looks delicious. Bill: If I didn't know better I would swear it was December! This is so beautiful. I love how you layer everything! The hydrangeas are gorgeous, my FAVORITE flower! I carried them when I got married! Bill, you did it again! Wow! Everything looks gorgeous. I can hardly wait to see pictures of your home all decorated for Christmas. When July hits, I begin my Christmas shopping and planning. What a delight today to visit your blog! Blessings to you. I loved your tablescape Bill! What inspiration! I'm doing Christmas in July at my place too, though this year I'm keeping it pretty simple. But I absolutely loved looking at your things.....it's what Christmas dreams are made of! 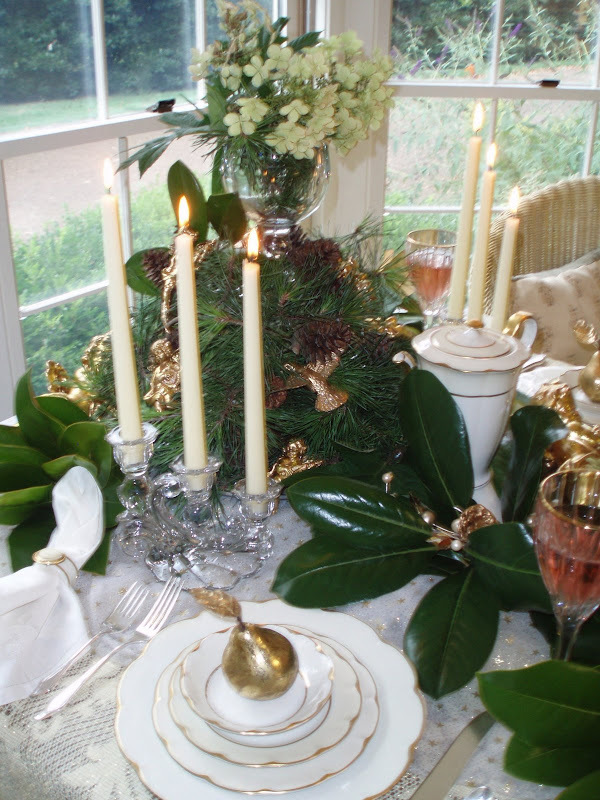 Bill, you have set a gorgeous Christmas in July table! I absolutely adore those beautiful swans. Happy TT to you! Your table is lovely. I have a big swan that was my Moms and she received it back in the late 40s as a shower gift. I love that Swan as my Mom used it for every season and holiday. I have not idea who made it but perhaps it was made by the company that made the one on your table. I do not do tablescapes as I do not have the dishes to participate but I enjoy looking at all the participants. Thanks for sharing your lovely table with me. Wow, Bill, you've done it again, created a timelessly elegant tablescape. May I ask if you are in the design field? You've got an innate sense of style. 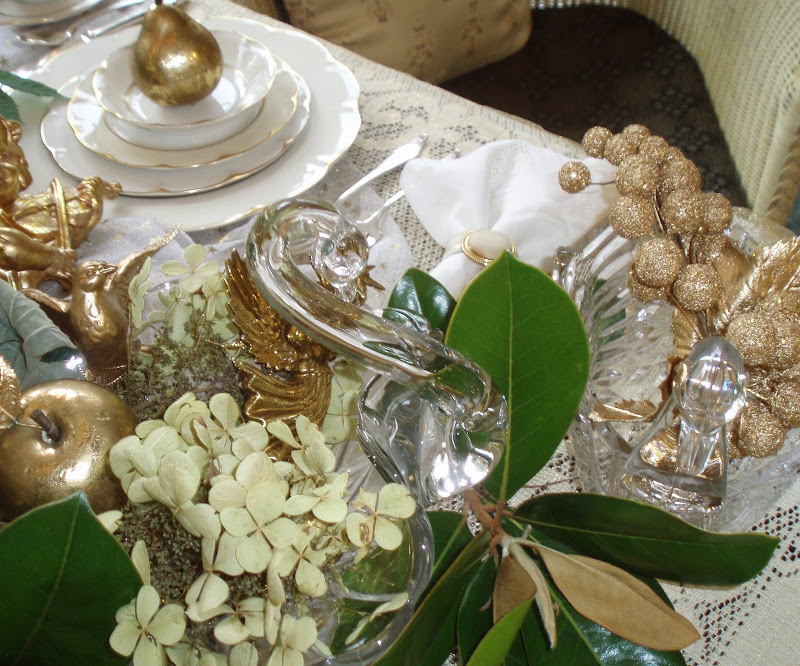 I love the combination of gold ornaments with the greenery and white dishes. Fantastic job! Gorgeous! My fave touch is the golden pears! 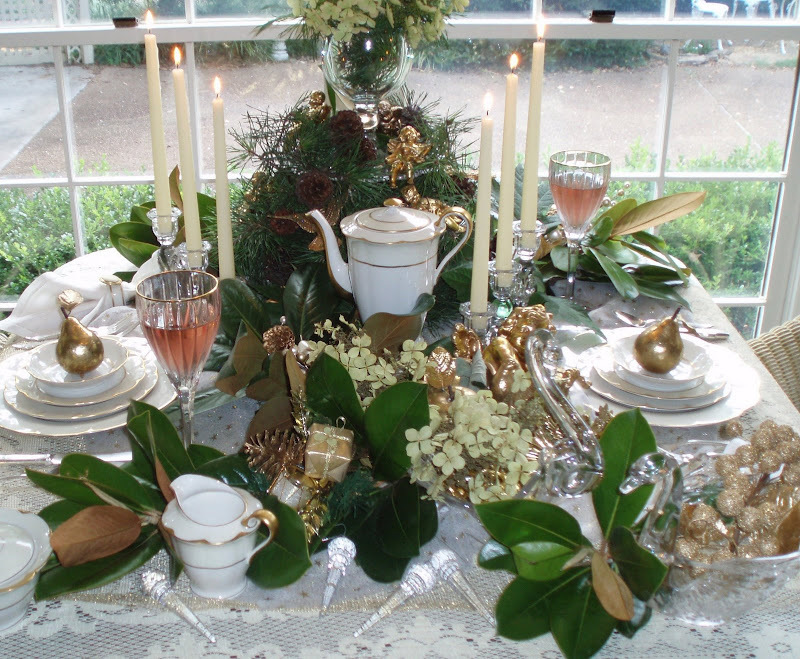 You are very gifted if you trew this together in a few minutes.You may make my christas tablescapes every day of the year! C'est chic et trés elegant. Merci et aux revoir. Wow, love what you did!! It is elegant and heavenly and peaceful. Bill, White and Gold are so classy! This was a wonderful tablescape! !